Thanksgiving is a day to indulge in all things food and family. Your pets are part of your family. It’s a no-brainer that you want them to be around during your Thanksgiving celebrations. However, if you think the holidays are stressful on you, you should think about your pet’s perspective. The period between Thanksgiving and New Years can be puzzling and nerve-wracking from a pet’s perspective. With endlessly ringing doorbells, bowls of forbidden candy, days of non-stop cooking, and gifts that can not be touched, the holidays can be stressful your pet. Pet’s don’t like to deviate from their normal routine. Understand that holiday activities may stimulate stress, tempt or confuse your pet. It is important to plan ahead so you and your pet can share in the holiday joy together. Some pets may be excitable or frightened by large groups of people and a lot of noise. Older dogs and pets with more particular personalities may prefer to avoid contact with your guests. This is when planning comes in handy. If your pet feels stress, provide a quiet room or space that they can retreat to. Before the day, condition your pet to go to the space. Then on the day, give them plenty of exercise. After greeting your guests, lead your pet to their quiet spot, play some soothing music and leave them alone with their favorite toy. If company is staying overnight, provide a sleeping spot in your room or ask your guests to respect your pets personal space. 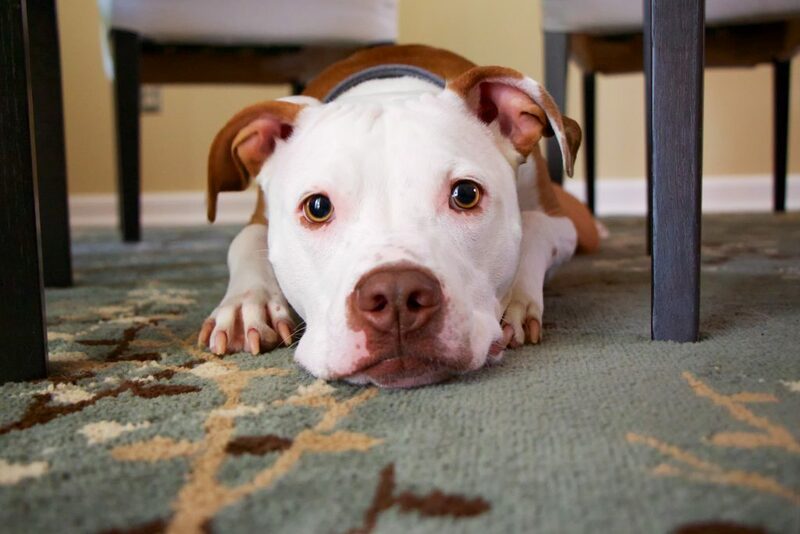 Before introducing your dog to guests, make sure they know their basic sit and stay commands. When your dog has learned these actions, invite a friend over to help you train them with new people. Have your friend walk toward your dog. If your dog gets up from his seated position, have your friend turn around and walk away. Command your dog to sit again. Ask your friend to approach again. Continue this training until your dog stays seated upon your friend’s approach. At this time, give him praise and attention – and maybe even a treat. Training should come with a reward whether it be encouragement or a small treat. This will encourage appropriate pet behavior around new people. Territorial dogs need to be deconditioned well ahead of time. If your dog likes to bark a lot, train them with the doorbell. Place your dog on a leash and stand near the door. Have a friend stand outside and ring the doorbell 10 times in 20-second intervals. While the door is ringing, have your dog focus on a handful of treats. Encourage the focus with phrases like “Say Hello,” and then use that phrase (and a lot of food rewards) to indicate your friend is a good visitor and welcome in your home. If your dog acts up when company is over, lead them to their safe spot and leave them there so they can destress. Puppies and social dogs may not tolerate isolation well. Plus, you may want some extra protection for dogs that you may not have time to train before Thanksgiving. Keep a leash on your pets and keep them close to you as family and friends come through the door. Keeping them on a leash is also an effective way to prevent them from running out the door. Make sure your pet is always wearing their identification tags, especially during the holiday season, just in case they escape. Meals are very confusing for dogs. People gather in pack-like formation around an elevated surface full of alluring odors. During the holidays, strangers are invited to the feast while our dogs are denied food entirely. Plus, not everyone is a dog person and may not appreciate a damp muzzle prodding at their leg for a piece of turkey. Before the day, begin to station your dog at a spot during family meals and quiet times. Make sure the spot is close enough to the table so they feel included, but not so close that they will be underfoot. Have them lay in a bed with their favorite chew toy or bone. Before mealtime, satiate their appetite by feeding them their food. Then when mealtime arrives, encourage them to lay quietly. You know the drill; cook, clean, shop, wrap, lather, rinse, repeat. If you’re feeling the holiday pressure, don’t take it out on your pets. Remember that to them, it’s just another day. If your holiday plans involve any sort of deviation from the routine and whose don’t, plan for your pet’s comfort ahead of time. The best way to ensure a happy pet and owner is to tucker them out. Before your guests arrive, take your dog on a long walk or schedule some free play to ensure that they are tuckered out prior to mealtime. Take your dog to the park or pull out their toys for an hour or two before guests are expected to arrive. If you tire them out before the holiday commotion, they will be less energetic for the rest of the evening. Plus, the pet-focused interaction allows you the chance to unwind and bond with your pet.